Nova is a quilter and quilt historian who began quilting in 1980. Teaching since 2003, she has developed a reputation for engaging students in active learning and giving individual attention to her students as she travels and teaches nationally. The relaxed style which draws her audiences into the presentation has made Nova a popular speaker with civic groups as well as quilt guilds. Nova has served on the faculty of the International Quilt Festival in Houston, Texas multiple years. She has been selected as part of the Kansas City Regional Quilt Festival for two consecutive terms, has been engaged by Texas A&M University as a guest lecturer, and selected as the featured teacher for a special event at the International Quilt Study Center in Lincoln, NE. Her specialty is the Singer Featherweight 221 sewing machine and she teaches a highly acclaimed Featherweight Maintenance Workshop. 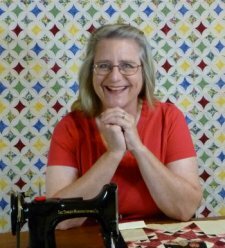 She has authored an article on Singer Featherweights for The American Quilter. Nova loves history and sharing her passion for quilts with audiences and workshop participants. She is currently lecturing on “Our History with the Singer Featherweight,” “A Century of Progress: The 1933 Chicago World’s Fair and Its Quilt Contest,” “Cotton,” and "Quilting in Colonial America". 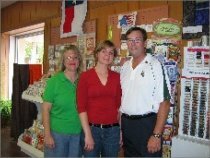 Nova and family at the Fabric Carousel in Huntsville, Texas. 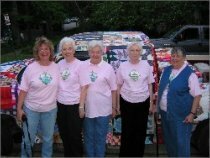 Nova and other Tall Pines Quilt Guild Members in front of the "Quilt Truck".